In March of 1973, a young male gray whale was found dead near the mouth of the Columbia River near Chinook, Wash. Twenty-seven feet in length and weighing close to six tons, the 14-month-old whale probably died while migrating north from Baja, Calif. 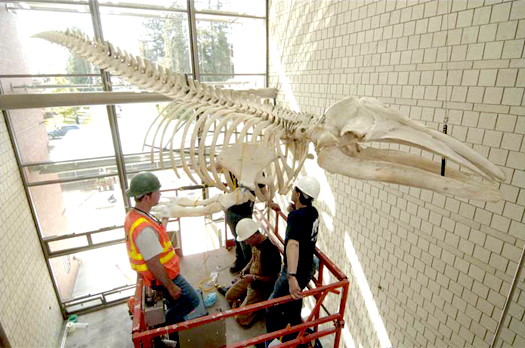 The entire skeleton was recovered and donated to the Slater Museum of Natural History to be displayed as part of the museum’s permanent collection and now hangs suspended between the first and second floors of the main lobby of Harned Hall, greeting visitors as majestically as if welcoming them to the depths of the Pacific Ocean. For more information on the juvenile gray whale, see the Slater Museum page.